2. Meanwhile, in a bowl, mix the caramel with the miso and set aside. Put the chestnuts in a small food processor and whizz until very finely chopped; remove 50g and set aside. Add 50ml double cream to the chestnuts in the food processor and whizz to combine. Add 1 egg yolk and 75g miso caramel and whizz until almost a smooth purée. 3. Remove 1 of the neat pastry circles from the fridge and place, with its parchment, on a work surface. Carefully spread 1 /3 of the chocolate spread in a ring around the edge of the circle, leaving a 1cm border at the edge and a 14cm diameter circle in the centre. Sprinkle the centre of the pastry with 25g of the reserved chopped chestnuts, then spoon ½ the chestnut purée on top, lightly levelling with the back of a spoon. 4. Sprinkle over the remaining 25g chestnuts to cover the purée. Remove the “rough” pastry circle from the fridge and, using the paper to help, upturn onto the base pastry circle to cover. Lightly press around the edge where the chocolate spread is. With a small sharp knife, carefully cut out (and discard) a 14cm circle from the centre of this pastry layer only, revealing the chestnuts. 5. 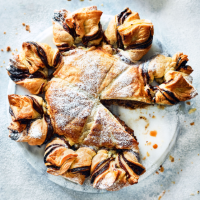 Spread the ring of pastry with another 1 /3 of chocolate spread – you don’t have to be too neat. Spoon the remaining chocolate spread on top of the chopped chestnuts in the centre, followed by the remaining chestnut purée. 6. Remove the final pastry circle from the fridge and use to cover the pastry ring fully, lightly pressing the edges together where the chocolate spread sits. Put an upturned bowl, about 16cm in diameter, over the centre of the circle. With a sharp knife, cut 16 x 6cm-long equally spaced slices into the pastry, starting from the outside edge of the bowl, working your way around the circle like a clock. 7. Take 2 slices and twist them away from each other twice, then lightly press the ends together. Repeat all the way round the circle – you should end up with 8 snowflake arms. Slide the snowflake, on its parchment, onto a baking sheet; chill for 30 minutes. 8. Preheat the oven to 190˚C, gas mark 5. Beat the remaining egg yolk with 1 tsp water and brush over the centre of the snowflake. Lightly score lines into the centre of the pastry, if you like, with a blunt knife. Bake for 45-50 minutes, until golden and cooked through. Gently heat the remaining miso caramel and 100ml double cream together in a pan until warm. Serve the snowflake warm, dusted with icing sugar, if liked, with the miso caramel sauce. TIP: The cooked snowflake will keep in the fridge for up to 3 days. To reheat, pop in the oven at 170˚C, gas mark 3, for 20-30 minutes until warmed through.